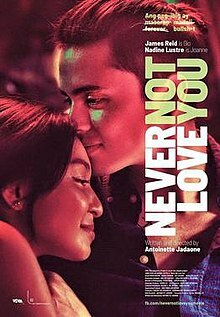 Never not love you is a 2018 Romantic Drama Starring James Reid and Nadine Lustre. The film is written and directed by Antoinette Jadaone. The film is distributed by Viva films with Project 8 Corner San Joaquin Projects. It premiered on March 31, 2018. The film follows young lovers Joanne (Nadine Lustre) a young trainee at an ad agency who has high ambitions for herself and her family and Gio (James Reid) a happy go lucky freelance graphic designer. The film begins with how the two meet and fall in love. On the brink of Joanne’s promotion , Gio having obtain a job on London offers Joanne to come with him. Once there Joanne was dissatisfied with her job as a cafe assistant and choose to go back to the Philippines. Their relationship soon ends as both choose different paths in life. Forward to 5 years later; Joanne and Gio meet once again but this has discovered that things have change; including their love for each other. This is the 3rd collaboration between JaDine and Director Antoinette Jadaone but this film happens to be their first project together. The two earlier projects which was both a TV Show, The first being the hit TV Show; On the Wings of Love followed by Till I Meet You. The first title of the film was originally ‘Five Years Later’ then it was change to ‘Here’s to the Fools’ but the title was finalized to ‘Never Not Love You’ by December of 2017. From the trailer itself, it already guaranteed that this is not just another love story or another JaDine love story. It also gave us a peak James and Nadine’s acting capability; that they can do more than their usual romantic comedy drama and that when given such material they can deliver a well acted performance. Other cast members include; Adrian Alandy, Sharmaine Suarez, Yayo Aguila and Josef Elizalde. For Filipino movie goers and JaDine solid supporters, this movie is a must watch!